On Feb. 20, activists with Fightback picketed the Toronto Consulate General of Pakistan at 7880 Keele St. to demand the release of Rawal Asad. Soon after we arrived, a few comrades went inside first to deliver a letter on behalf of Fightback addressed to the consul general. We were able to meet with the vice consul general, Mr. Muhammad Junaid Wazir, and delivered the letter along with a breakdown of events that occured on the day of Rawal’s arrest. SNC-Lavalin affair: The whole damn system is guilty! On Feb. 7, 2019, The Globe and Mail published a story which alleged that Justin Trudeau’s office “attempted to press” former Attorney General Jody Wilson-Raybould to interfere in the corruption case of SNC-Lavalin, a major Canadian construction firm. According to the Globe, Raybould resisted the pressure, leading to her removal as Minister of Justice and demotion to Minister of Veterans Affairs. What has unfolded since then is a political drama that has dominated news headlines, unveiled the shady inner workings of the Liberal Party, and threatens to discredit the country’s political and business elite. Something, no doubt, is rotten in the state of Canada. Is a Mexico boycott the way to save GM Oshawa? Last November, GM announced the closure of its plant in Oshawa and in four American cities. Production will be shifted to Mexico, where wages are lower and labour rights are almost non-existent. In response, Unifor, the union representing Oshawa GM workers, has called for a consumer boycott of Mexican-made vehicles to pressure the company into staying put. However, whatever the intentions, this approach may end up doing more harm than good. RCMP attack on Wet’suwet’en camp: No reconciliation is possible under capitalism! On Jan. 7 the RCMP, including members of the Tactical and Emergency Response Teams, attacked and dismantled the Gidimt’en checkpoint on Wet’suwet’en territory in Northern British Columbia, arresting 14 people. The Gidim’ten checkpoint was set up in December 2018 after the B.C. Supreme Court granted TransCanada Coastal GasLink an injunction to remove another camp, the Unist’ot’en checkpoint, which was established in 2009 to control and block access by pipeline corporations to Wet’suwet’en territory. In November of last year GM announced that they were closing their plant in Oshawa. Approximately 2,500 workers will be directly affected by this, while workers from parts and feeder plants also stand to lose their jobs. In total, the closure is going to lead to an estimated 20,000-30,000 people unemployed in Durham Region. SIGN THE PETITION: For a Student Strike Against Ford’s Education Cuts! On Jan. 17, the Ford government announced a series of deep cuts to post-secondary education, primarily impacting low-income students. In order to stifle his opposition, Ford also announced measures that would undermine funding for student unions, student newspapers and campus clubs. This is a direct attack on working class students, campus workers and student democracy, and must be opposed by all means possible. We publish here a translation of the first of a four-part article on the history of the Parti Québécois written by Julien Arseneau, member of the editorial board of the Quebec Marxist journal and website, La Riposte socialiste. In mid-January, the Ford government leaked news that it would be reducing tuition fees by 10 per cent across Ontario. The decision was immediately met with suspicion by students. Their suspicion, it turns out, was justified. 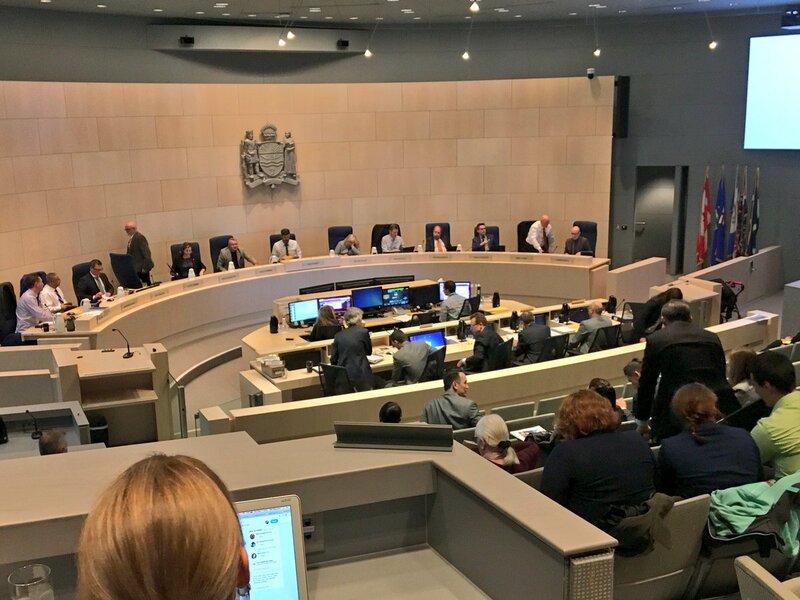 Edmonton City Council recently passed its 2019-2022 municipal budget—and austerity is on the menu for the next four years. Mayor Don Iveson himself admitted that this was the hardest budget passed in more than a decade. What will follow are cuts in services and programs reducing their overall quality, putting a heavier daily workload on city workers, and imposing higher living costs on Edmonton residents. Recent studies by the Conference Board of Canada brought to light the horrible food situation in Nunavut. In 2016, they released their Food Report Cards that looked at industry prosperity, diets, food safety and household food security in each province and territory. This revealed a food insecurity rate of 51 per cent in Nunavut, which means 1 in 2 people cannot get enough to eat. Balanced healthy meals are out of the question and smaller meal sizes are necessary to make food last. This crisis that silently lingers is greatly affecting the indigenous population - which makes up 95 percent of the population of Nunavut.